As part of the South West Rail Link, the Glenfield to Leppington project has changed the landscape of passenger rail in Sydney’s south west…. 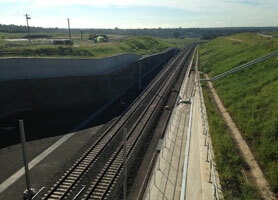 The Glenfield to Leppington project incorporates a new twin track passenger rail line approximately 11 km in length from Glenfield to Leppington and associated infrastructure, including construction of two new stations at Leppington and Edmondson Park, construction of a train stabling facility and construction of ancillary facilities including power supply, substations, sectioning huts, signalling structures, access roads and other infrastructure. Our role as Environmental Representative was to independently oversee the implementation of all environmental management plans and monitoring programs, independently advise the Proponent on its compliance obligations against all relevant requirements of the Concept Plan, Project Approval and Statement of Commitments, permits and licenses and have the authority and independence to require reasonable steps to be taken to avoid or minimise unintended or adverse environmental impacts.